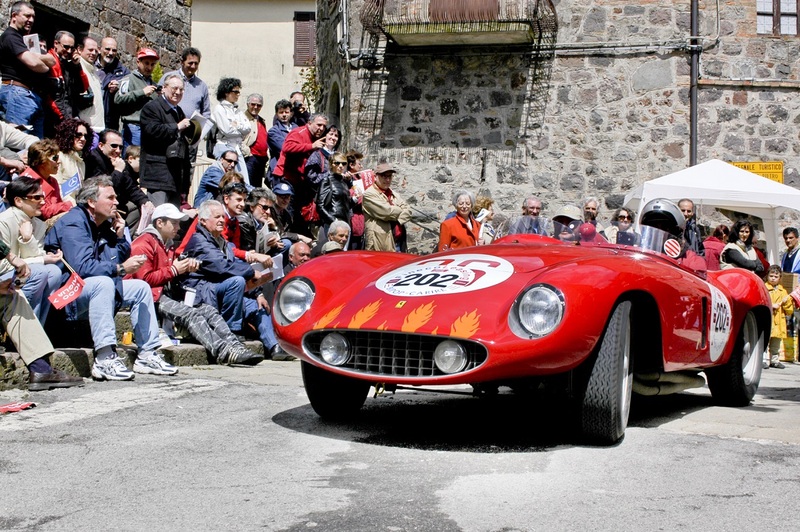 When Paolo Giraud, the French racer, offered me the opportunity to take part in the Mille Miglia race in 1953, I didn’t hesitate and instantly replied “yes”. It had always been my dream to be able to take part in the most exciting race in the world, and to tell the truth, even my original hopes and expectations fell far short of reality. 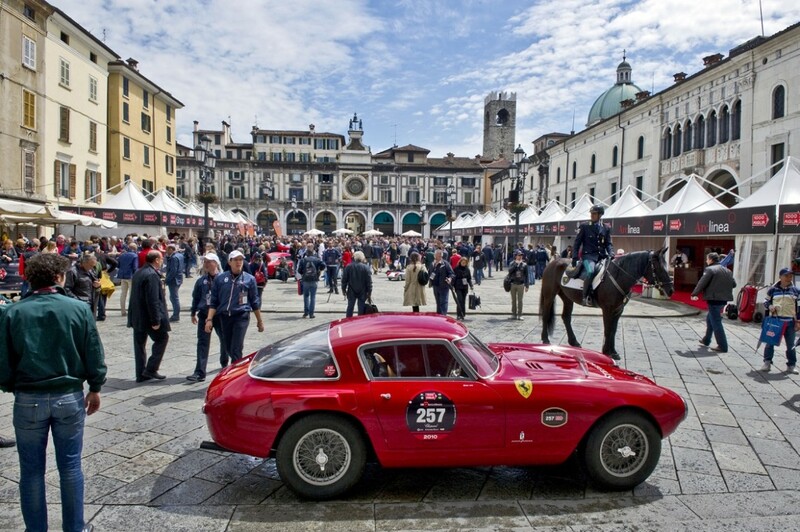 There would be three days of intense emotions and new sensations, which began as soon as we were heading down the motorway from Milan to Brescia for the punching ceremony and started to meet the first cars sporting a competition number. In Brescia the atmosphere was electric. 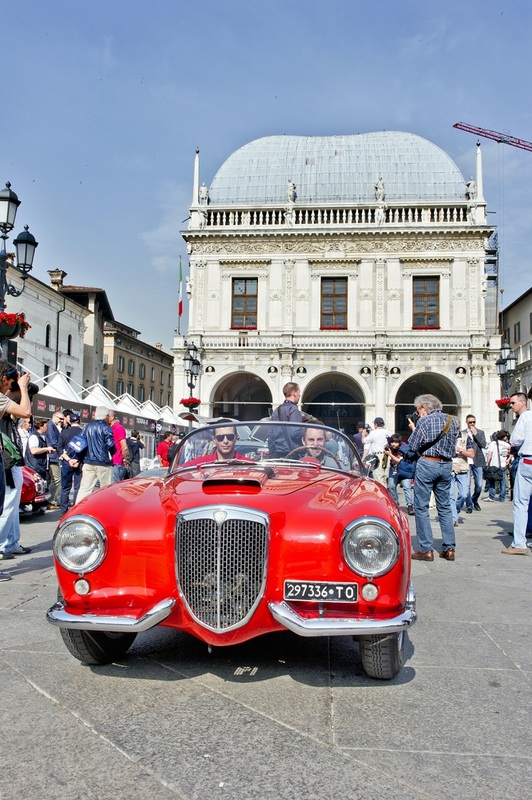 In the streets, the squares and bars you could only hear people talking about average speeds and engine power. The townspeople lived the event like a party, spending hours in the streets, only popping up to their flats to eat something quickly, and then coming back down and joining in with the predictions about the weather, average speeds and the possible victors. The youngest fans were already dreaming of becoming future champions and in the evening, exhausted after having followed and assaulted one car after another in order to get autographs, they finally closed their eyes and devoured kilometres on white streets with ultrasonic cars. The names are called out from loudspeakers, the crowd moves, and everyone from the most modest driver to the most celebrated ace enjoys the same level of popularity. I found myself in the car with three or four pencils and as many sheets of paper, thrust into my hand by enthusiastic boys in search of autographs. Even I felt important in that moment. And finally the evening came and it was nearly time for the race to start. We sat down listening to some final advice from our more expert friends while we tried to eat something. But it was strange I had lost my appetite completely. A strange sensation took hold of my whole body reminding me of when I was at school just before an exam. Was it fear? No I don’t think so, more a type of release of tension for something, long-awaited, that was about finally about to happen. And then, there we were, in the enclosure, before leaving. You could hear comments from the public “Look there is a woman!”, to which was added “She must be mad”, while others were more encouraging shouting out “Brava!”. Everyone is looking at you and commenting. The seconds tick by rapidly and we find ourselves at the starting line. “10 seconds…… five…. go! And the most marvellous race in the world has begun. One of the first things that struck me was the crowd. This large anonymous mass lining the route, shouting for us, following us, encouraging us; a crowd of men, women and children, huddled behind the straw bales placed at the bends, taking over every inch of available space, forming a type of black barrier separating the road from all that surrounded it until you gradually become accustomed to it. The officials are perfect, every bend is marked clearly, indeed in some points the signs are nearly excessive, so much so that in the end you’re not sure if you should take your foot off the accelerator or carry on cruising at full speed. Well this is what happens when you take part the race for the first time like us. 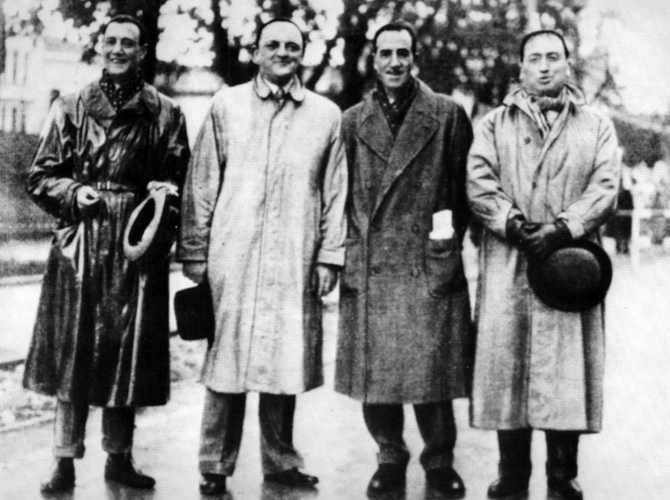 The following year (yes, I’d already enrolled for the 1954 race) we too would be able to discuss the dangers of Polesella and Pontelagoscuro or the bumpy surface at Radicofani with a more competent air, and gain some precious minutes. Just when we had got used to the risks, the night and the trails of neon light from the bars and shops as we passed through towns and villages, all lit up as if it were day, an unpleasant surprise was awaiting us. Just before Rovigo we ran into fog. At first it was patchy, then it became thicker and then really dense. After muttering some curses in French and Italian we redoubled our attention. My companion never spoke, every now and then I would offer a “to the right…… to the left……a level crossing” but that was all. Eventually the fog left us and slowly so did the night. 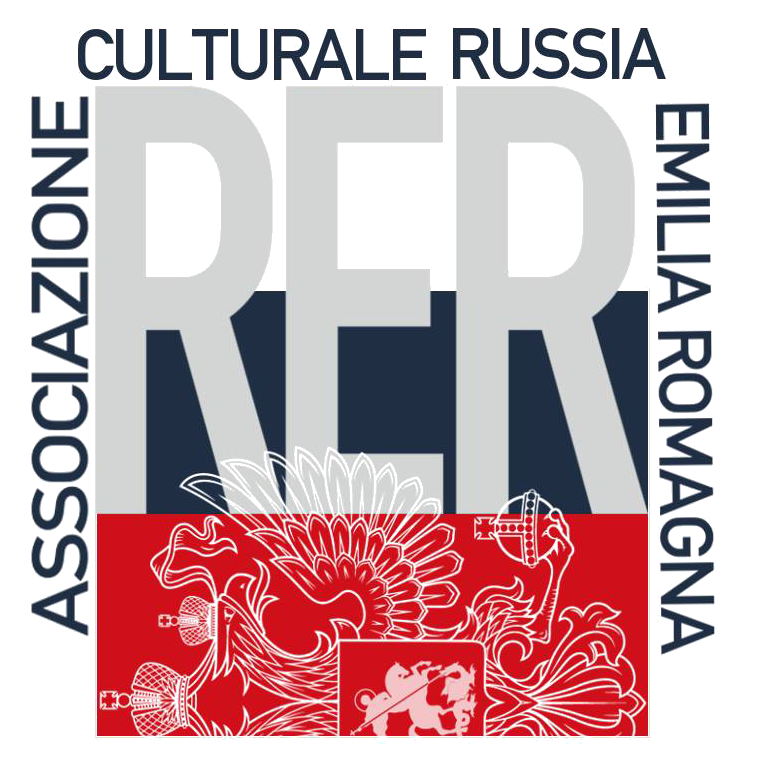 We began to make out the sea and we passed through seaside resorts where I had spent holidays as a child, enjoying myself playing with the sand: Rimini, Riccione, Fano,San Benedetto del Tronto. And then it was dawn, with a newly born red sun, rising among clouds that were still black like the night, producing mixed reflections on the sea, sometimes golden, sometimes dark, tempting us to take a break and feel the sand under our feet and refill memories with the salty perfume of the beach. But that is the cruelty of this race, you will see everything but can stop for nothing. Constantly racing onwards towards new beauty which we would have to refuse and sacrifice to the “Race God”. Then the road began to climb from the sea towards the mountains, the sunlight falling on snowcapped summits, the rising and falling road of Sella di Corno, followed by the calm and silence of Abrruzzo, and then, the majestic Roman countryside. Suddenly we were in Rome, the crowd urging us on in their picturesque dialect, and then the Radicofani pass, with its insidious bumps, and then peaceful ancient Sienna with its mediaeval red walls trembling as the impatient cars sped by, before coming to beautiful Florence. “Now for the best part” I think to myself as the car begins its assent of the Futa pass. “Shall I put on the helmet or not? Well at the end of the day you never know what might happen, so I put it on. The race is becoming increasingly passionate, groups of people are perched on any raised areas, cars, scooters, tents, all lining the road – the usual landscape giving way to these fanatical anonymous fans. The remaining kilometres fly past and Brescia approaches. We pass Piacenza and there it is, the final bend… and it’s done, the chequered flag waves us through and a man complements us I feel stunned, it was all so beautiful, so exciting, and so fast. It’s hard to believe that it was only yesterday that we were on the starting line and now, just one day later we’re enjoying the party with our friends. There is only one dark cloud: two of my friends are not back. One of the treacherous bends betrayed them and their beautiful car finished up in the grass and they have been taken to hospital, luckily it seems with very minor injuries. They have paid their tribute to the ruthless cruelty of the race. “Part of me wants to set off again immediately” says Giraud and he is right. It was all too wonderful and too immediate and whilst everything was still part of me, I felt that the experience was already slipping through my fingers and so I vowed that I would see myself on the starting line another year. 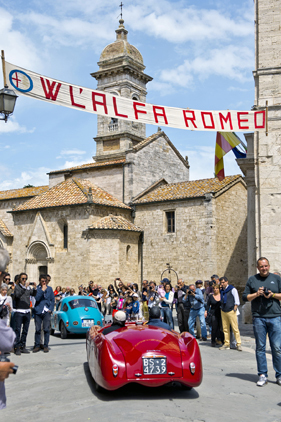 Anyone touched by the burning embrace of the Mille Miglia finds it hard to resist the temptation to return and take part once again in the most beautiful race in the world. 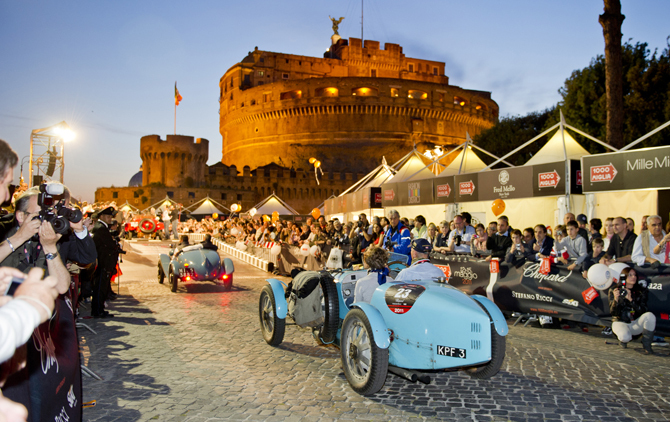 Share the post "Mille Miglia: A Woman’s Tale"